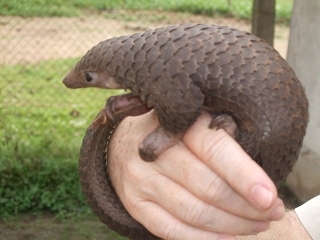 It appears that by maintaining a legal trade quota for Pangolins – and for countless other species endangered by extinction – CITES unwittingly engineered a sufficiently safe escape route for poachers, smugglers and traders of endangered species. As long as there is a legal trade quota exists the only challenge for these perpetrators is to find a fake certificate stating that the item along is part of the legal quota. How difficult is it?! Whereas if there was no legally allowed quota, carrying or having such an item itself would be sufficient reason for being arrested immediately. By a simple administrative decision CITES would be able to pose significantly higher threats for these perpetrators. Our goal is to submit a request to Mr. John E. Scanlon, Secretary General of CITES in Geneva, Switzerland, to make the necessary steps without delay to set the trade quota for Pangolins to ZERO. We are sure he would be glad to do it as soon as this initiative, backed by sufficient number of signatures, reaches his desk. Annamiticus, an educational nonprofit organization celebrates the World Pangolin Day on the 3rd Saturday of the year and they created a website and a facebook page to support their movement. One day attention to these illegally threatened species is by far not enough. A zero annual export quota has been established by CITES for four Asian species whilst African species are listed on Appendix II of CITES, meaning that there is a legal quota for their international trade. CITES by definition – unfortunately – does not concerned about domestic trade of any endangered species regardless of their threatened status. The species is eaten as bush-meat to various extents across its range (e.g. South Africa, Zimbabwe, Namibia, Mozambique, Tanzania). Of greater threat is over-exploitation for body parts and scales which have superstitious value and are used for medicinal purposes. In Tanzania Temminck’s Ground Pangolins are sometimes referred to as Bwana mganga (‘the doctor’) because every body part is believed to have some medicinal value (Wright 1954). Many East African people believe that burning pangolin scales keeps away lions (Kingdon 1971). Across their range the scales are widely believed to bring good luck and to bring rain, while smoke from burning scales is said to improve the health of cattle and cure persistent nose-bleeding. The isiZulu believe that seeing a Pangolin indicates that there will be a drought, and the only way to prevent the drought is by killing the animal (Kyle 2000). Scales are also used as talismans and in traditional dress (Kyle 2000, Manwa and Ndamba 2011). In Zimbabwe it is traditionally a good omen to catch and present Temminck’s Ground Pangolins to a superior such as a local chief, and hundreds of individuals were captured and presented to the Zimbabwean president and other authority figures at the onset of majority rule in Zimbabwe (Coulson 1985, L. Hywood, pers. comm. ).